Catholic Weddings can be legally binding. For those who do not require a legal wedding or wish to perform the legal ceremony in their home town, it also possible to organize a simple religious blessing. Wedding receptions, if required, can be held in some of the many nearby venues available. You can choose between breathtaking palaces, open air gardens, first class hotels, budget restaurants, private islands. A Catholic wedding in Venice is much cheaper than you can imagine. Our packages range from budget solutions to grand wedding events. 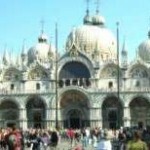 There is a great variety of wedding reception venues in Venice. Of course the first class hotels offer impeccable service and quality, but also the medium and budget range of venues we have selected do indeed have high quality standards. Both indoor and outdoor options are available. One of our favourites is a private island just in front of Saint Mark’s Square. A ten minute boat ride for you and your guests to a beautiful venue where it is possible to organize a magnificent garden reception with a view, or an outstanding indoor option. 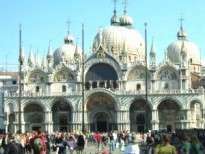 If you are interested in receiving some special proposals and prices for your Catholic wedding in Venice, please do ask us for a quote. We will be happy to reply to all your questions.